This is a very important maintenance. Do a valve adjustment at least once a year. 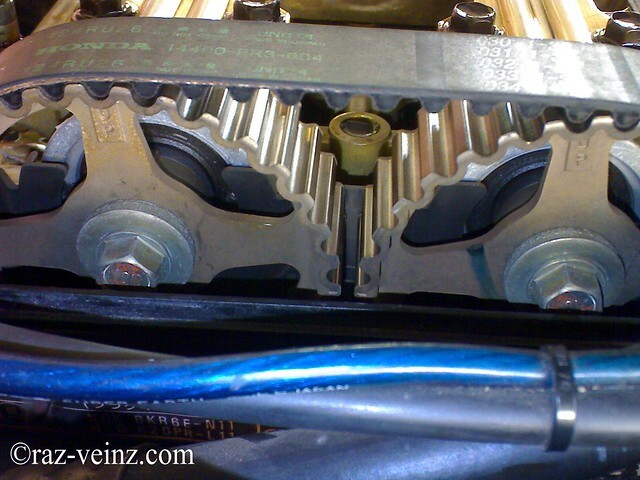 Why do you need to adjust your valves clearance? 1. To make sure your valvetrain stays in good shape. 3. To decrease unwanted noise, tap, tap, tap, tappet! 4. Will greatly increase the life of your engine. 5. The engine will breath and exhale better. 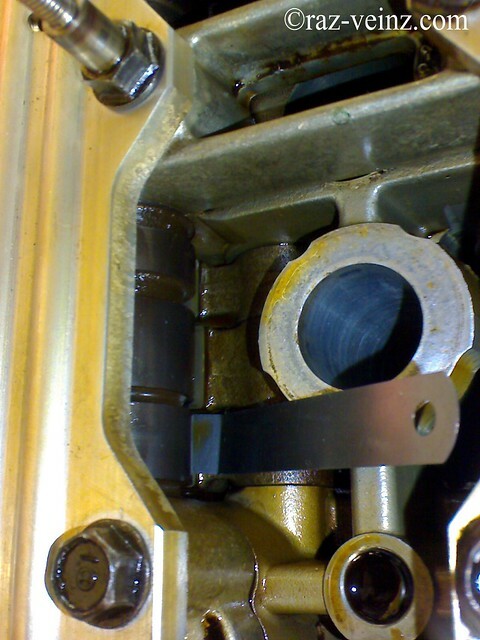 The conventional means of adjusting valve actuation always require a small clearance to be left between the valve and its rocker or cam follower to allow for thermal expansion and wear. yourself or others. This is how I did it and it worked for me. 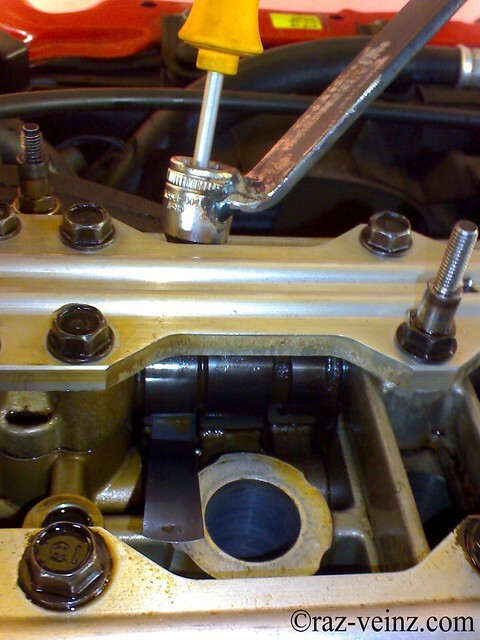 Valve should adjusted when the cylinder head temperature is less than 38°C (100°F). Start by turning the front wheels to the left. Lift the passenger side (Right-hand car) of your car with the jack, this will give you adequate clearance to reach the main crank bolt. But if you want more room, then, remove the tire, open the splash shield a little bit, this will give you the opportunity to check your left stopper rubber and oil pan condition. 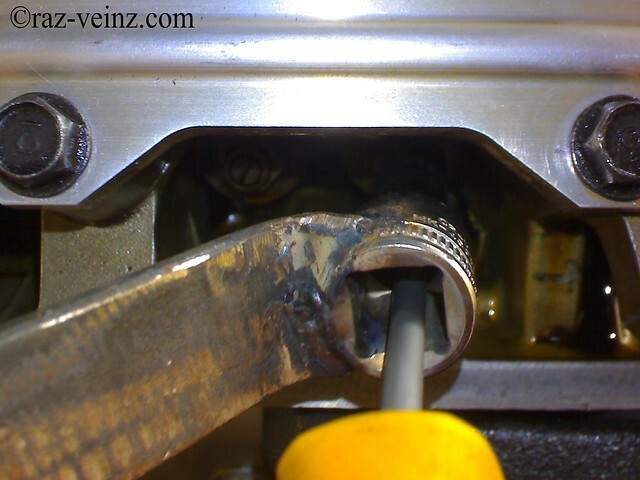 I use a long extension and 19mm socket to turn the crank, don’t turn it right now, wait until the next step when we need to set the crank at Top Dead Center (TDC). Reminder : Make sure your cylinder head temperature is less than 38°C (100°F) and make sure the transmission in neutral before proceeding the next step. 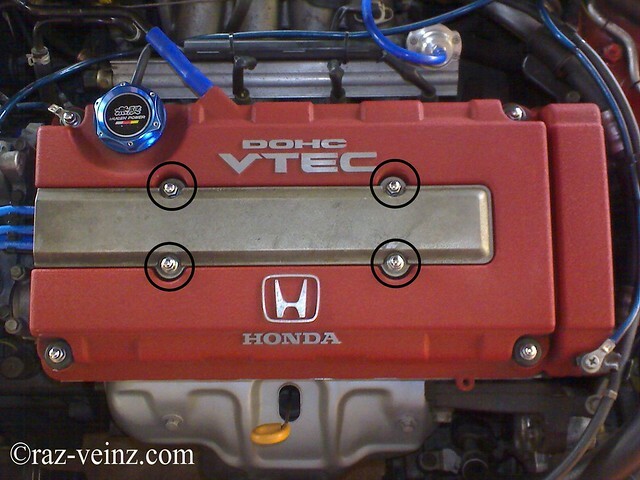 Locate your valve cover, remove the spark plug cover. 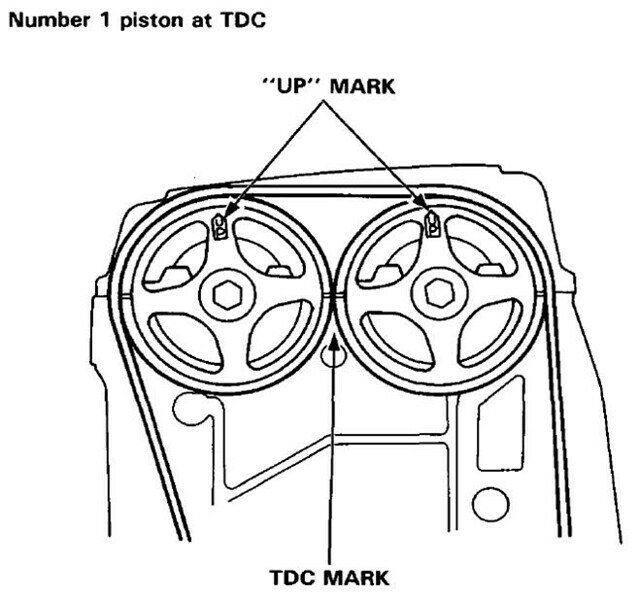 Remove all spark plug wires and the nuts circled in yellow (yellow?) 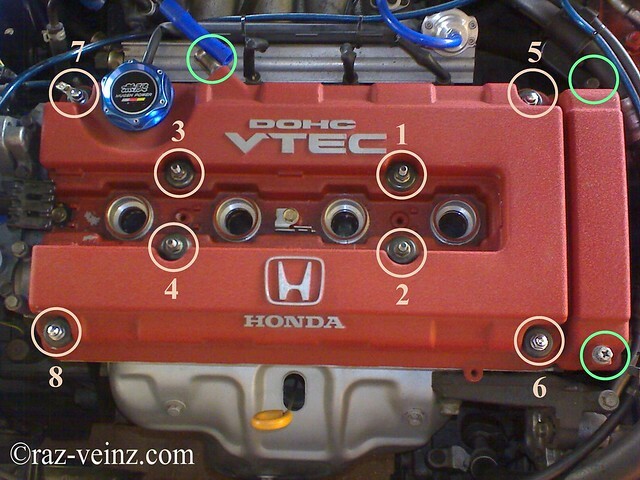 follows the sequence from 1-8, and remove the other thing that attached to the valve cover (green circle). 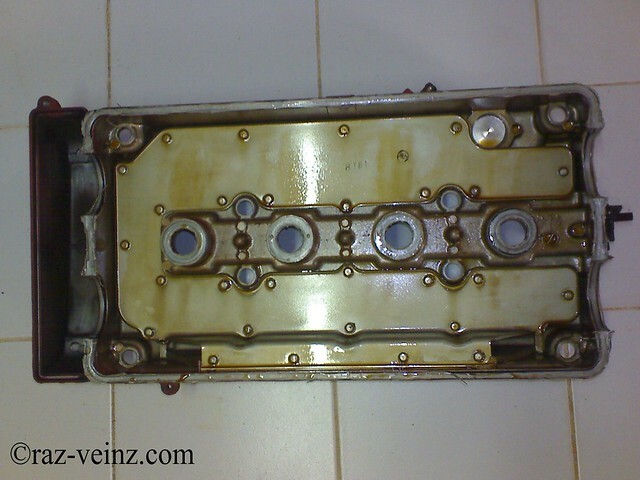 Now the valve cover is ready to come off, just wiggle it a little bit and it should pop right off. 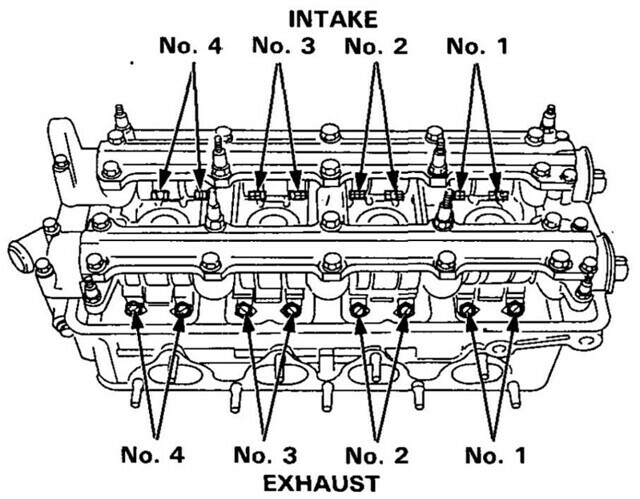 The location of the adjustment screw pair for intake and exhaust side, the number also refer for the piston, no. 1 = piston no.1. 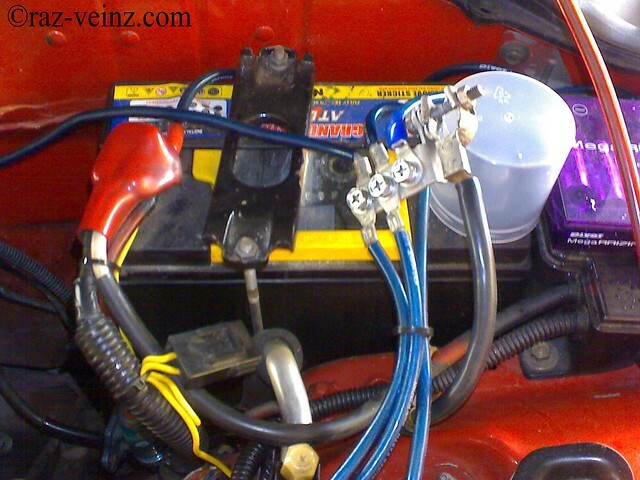 It will also make it easier to turn the motor over if you remove the spark plugs. Optional. TIP: Sometimes it’s easier to pull the plugs out of the block by using the plug wires to grab them after you’ve loosened them if you don’t have a spark plug socket. I used 16mm magnetic socket. 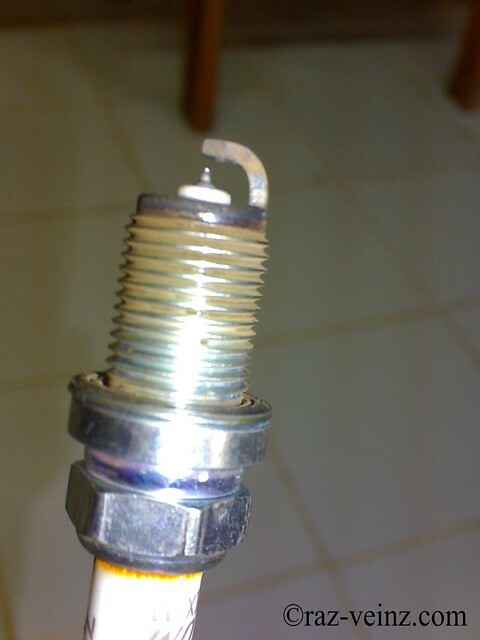 If you remove the plugs, be sure to inspect them as they can tell you a lot about how the car is running. A light brown color indicates a perfect A/F mixture. White is lean likewise black indicates rich. If you see dampness or oil on it, then you are in trouble. Mine is functioning optimally. Start by setting the no. 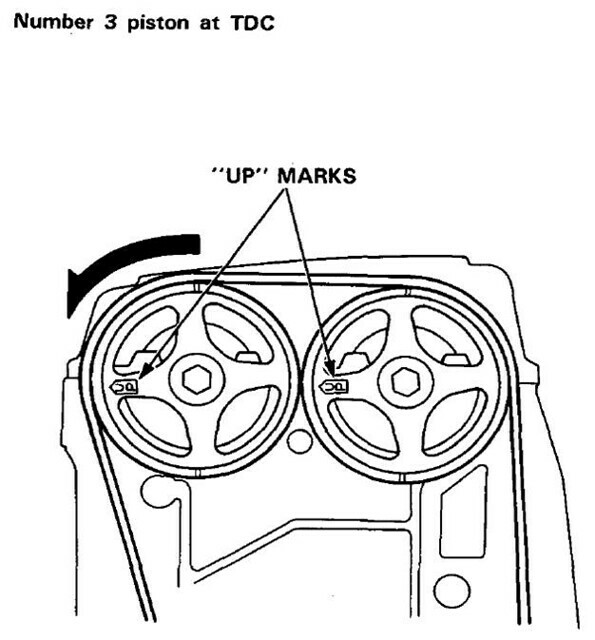 1 piston at Top Dead Center (TDC) by turning the crank pulley until the “up” arrows on the cam sprockets are facing up. 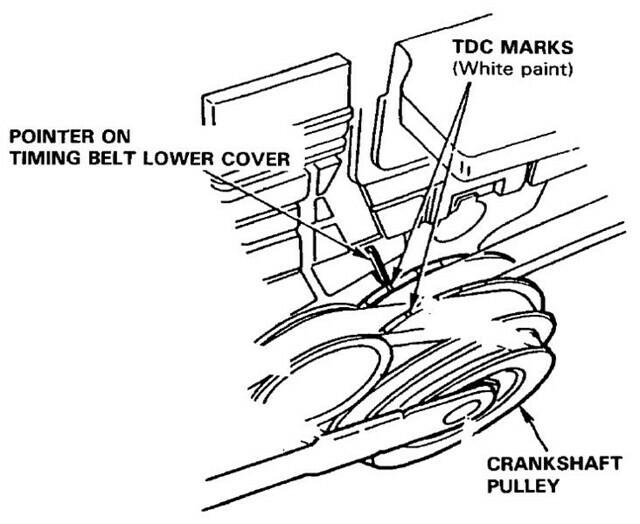 Turn the crank pulley only counter clockwise! 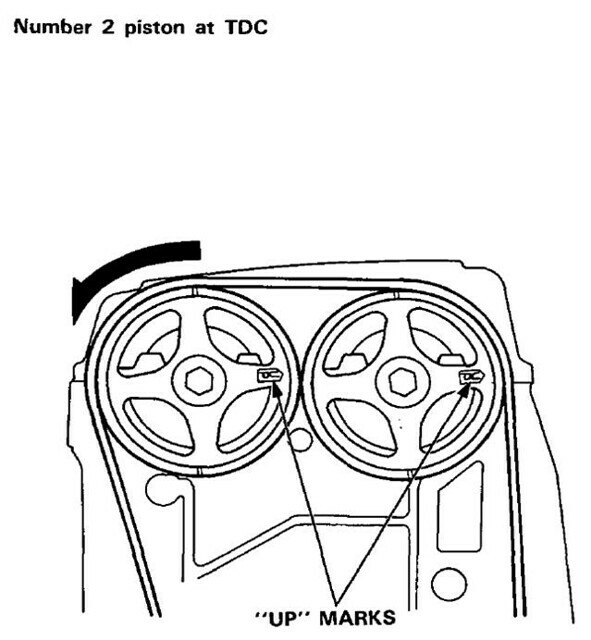 If you over turn, don’t try to turn the motor backwards, just keep turning another 2 rotations of the crank until you get back to your TDC point. It should be a white mark and or a notch on the crank pulley. Try to look at the no. 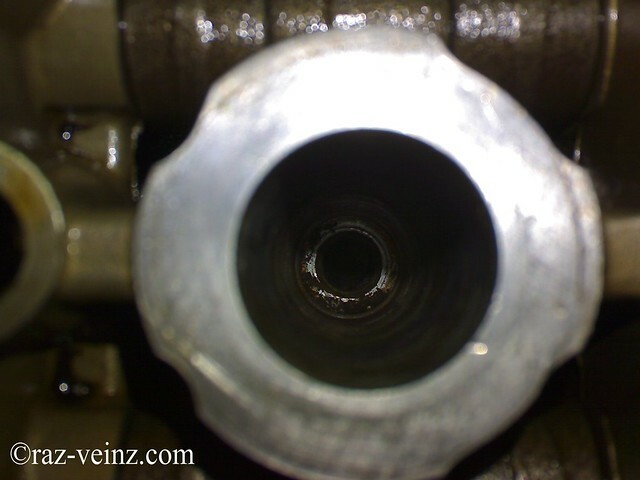 1 piston spark plug hole, the piston should be at the very top, that is the meaning of Top Dead Center (TDC) (Sorry for the unclear picture). 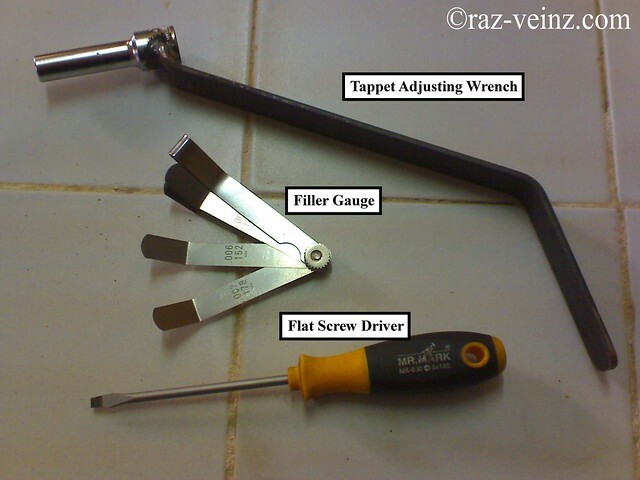 You need: a set of feeler gauges (use an angled feeler gauge), 10mm tappet adjusting wrench (this is the my home made tappet adjusting wrench, just a long socket combined with the flat metal, needed to hold the locknut in place and the flat head screw driver is for turning the adjustment screw on B16A, B16B or B18C motors. Not all the Honda’s engine needs this special tool. I have tried to only use normal long socket+extension, it works! But need more trial and error and time!). 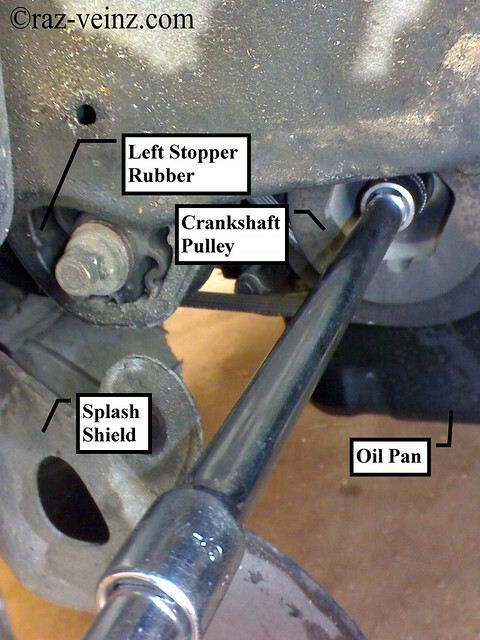 Honda has a specific tappet adjusting wrench, the part numbers are 07MAA-PR70110 and 07MAA-PR70120. This is a special tool and also come with the “special” price, and of course my poor dealer didn’t have this one and even don’t know what it is! Check the valve clearance for no. 1 piston. I slide the 0.010″ gauge between the rocker and the camshaft (in the gap below the cam lobe) for both sides (intake & exhaust), It slips through easily! I think the last owner probably never had a valve adjustment. Actually, I only using 3 gauges, 0.006″, 0.007″ and 0.008″. 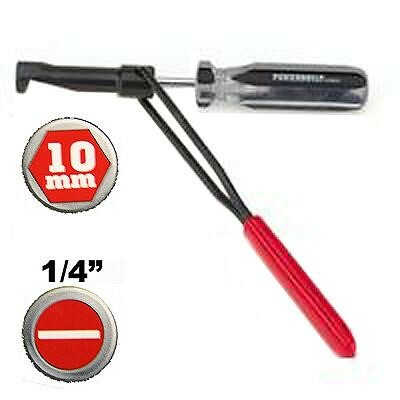 Hold the locknut using the tappet adjusting wrench, and turn the adjustment screw, for the intake side, until 0.006″ feeler gauge slide back and forth with a slight amount of drag and 0.007″ feeler gauge shouldn’t. Same procedure for the exhaust side, .007 should slide in, but the .008 shouldn’t. Piece of nut. 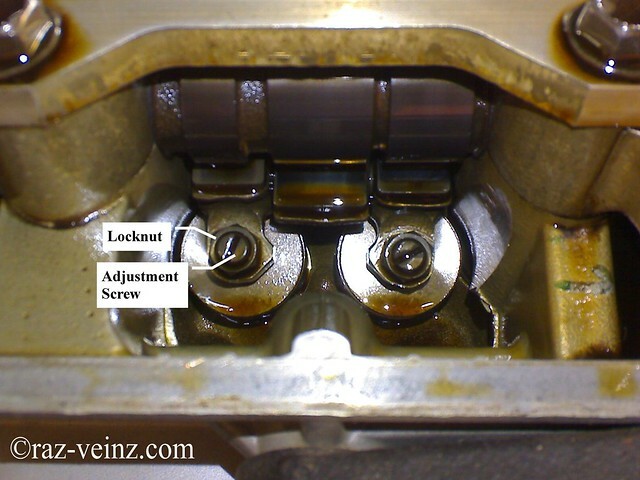 After having the right clearance, hold the adjustment screw and tighten the locknut. Then torque locknut to 20 Nm (14 lb-ft) (be careful to not overtorque the nuts as they strip very easily!) and measure the clearance again. Torquing it will increase the clearance slightly, so keep this in mind when you’re adjusting them so you don’t have to keep repeating the process. Repeat adjustment if necessary. After you are done with the 4 valves on no. 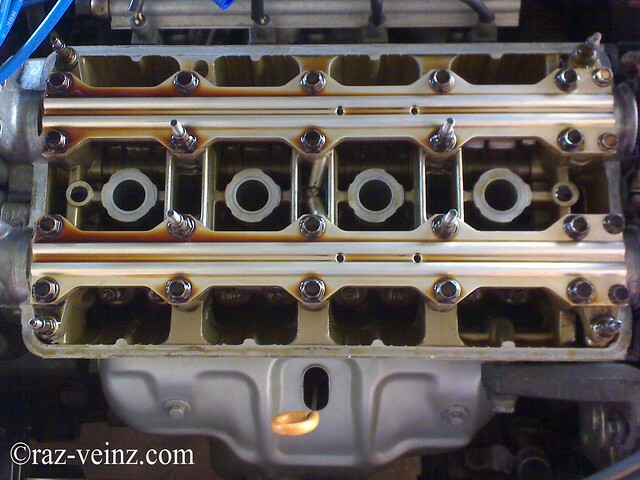 1 piston, move on to cylinder 3, 4, then 2, in that order. 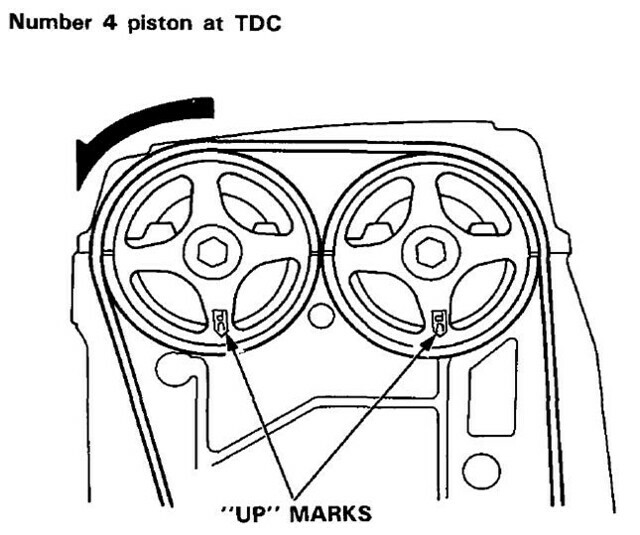 You will need to crank the motor to TDC for each of the cylinders you will be adjusting. 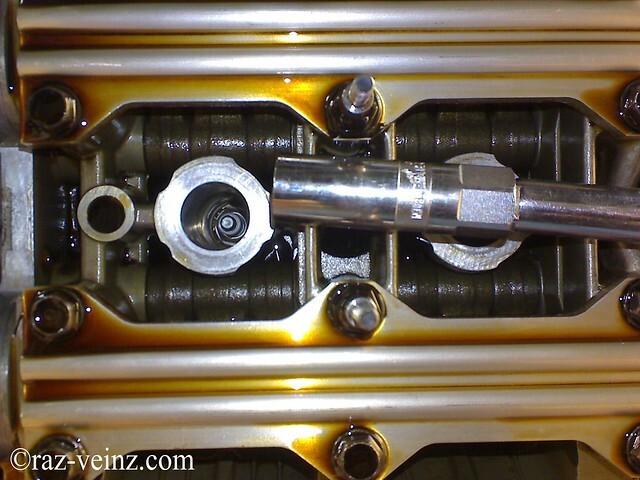 Do the same process as before on each of the cylinders. Repeat the process, double check, triple check, maybe you will find the clearance out a little bit even you have tightened the locknut, don’t worry, it’s normal, repeat the process until no adjustment is needed, I do about 5 times to get it correctly and precisely! Most of the re-installation process is the opposite of removal. Has an idle problem after Valves Clearance/Backlash Adjustment? Idle roughly before engine warm up? If you done correctly and precisely, it should be no problem, reset the ECU by pulling the 7.5A fuse in the fuse box under the hood about 10sec and drive around 100km (on/off), sometime ECU needs to “relearn” for the new setting. Have a fun and enjoy with your achievement!